This MSci, accredited by the Royal Statistical Society, offers an additional year of study on top of the Mathematics and Statistical Science BSc. Students have the opportunity to specialise further by taking more advanced modules and completing a major project. No previous knowledge of statistics is required. A*A*A with A*A* in Mathematics and Further Mathematics, or A*AA with A*A in Mathematics and Further Mathematics, any order, and a 2 in any STEP Paper or a Distinction in the Mathematics AEA. A*A* in Mathematics and Further Mathematics. A score of 20 points in three higher level subjects including 7 in Mathematics, or 19 points in three higher level subjects including 7 in Mathematics and a 2 in any STEP paper or a distinction in Mathematics AEA, with no score below 5. A score of 19 points in three higher level subjects including 7 in Mathematics, or 18 points in three higher level subjects including 7 in Mathematics and a 2 in any STEP paper or a distinction in Mathematics AEA, with no score below 5. Successful completion of the WBQ Advanced Skills Challenge Certificate plus 2 GCE A-levels at grades A*A*A, or A*AA and a 2 in any STEP paper or Distinction in AEA. To include Mathematics and Further Mathematics. The programme is an excellent preparation for becoming a professional statistician or an actuary. The programme is accredited by the Royal Statistical Society. On application to the society, graduates are awarded Graduate Statistician status provided that at least second-class Honours has been obtained. This programme is accredited by the Royal Statistical Society. On application to the Royal Statistical Society, graduates are awarded Graduate Statistician (GradStat) status, providing formal recognition of a member's statistical qualifications. In the first and second years of the programme you will take a balanced selection of modules in both UCL Mathematics and UCL Statistical Science. You will take a selection of designated modules in the third year and undertake a major project in your fourth year, which will include a substantial piece of written work and a presentation. Statistics will include much practical work while the mathematics will cover the theoretical aspects of the pure mathematics required to sustain and understand this. Up to 0.5 credits may be replaced by an outside option, subject to department approval. All final year modules are optional. Currently available mathematics options are described on the UCL Mathematics website. Most modules are assessed by two-hour written examinations in the third term, with a small element (10%) of coursework assessment. 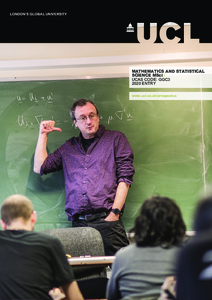 Detailed course descriptions are available on the department website: Mathematics and Statistical Science MSci.